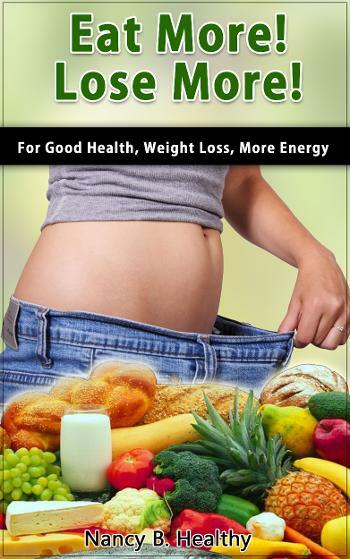 This book is the foundation manual for the "Get Healthy Revolution." It is a system of eating to get healthy. As a "side effect," you will lose weight and have more energy—both physical and mental!! I’m talking about real permanent results that last a lifetime, for this is a comprehensive system that encompasses all aspects of your life. It's not a diet plan--It's a life plan. The guide includes eating real food, energy exercises, and inner support--to energize you to live, love and dance--and manifest that special dream. It lasts a lifetime, for this is a comprehensive system that encompasses all aspects of your life. So it's not a diet plan--it's a life plan so that you energizes you to live, love and dance.In the “Eat More” system, you eat real food—a mandatory six meals or snacks a day. I know it sounds laborious—who has the time? That’s where I come in. I have worked out a plan for you, step by step. You start with changing your breakfast. I have given different suggestions for summer and winter, so your body has extra fuel for the cold weather. You will feel better after just completing this first phase. Then you will have energy and inspiration of move on to the lunch section, and then dinner (30 min. max prep time). Are you tied of dieting?? I have been a chronic dieter my entire adult life. I kept dieting and studying nutrition until, slowly, but surely, I figured out a system that works. Just get healthy and the rest will follow. You will lose weight and have more energy—both physical and mental!! I’m talking about real permanent results that last a lifetime. 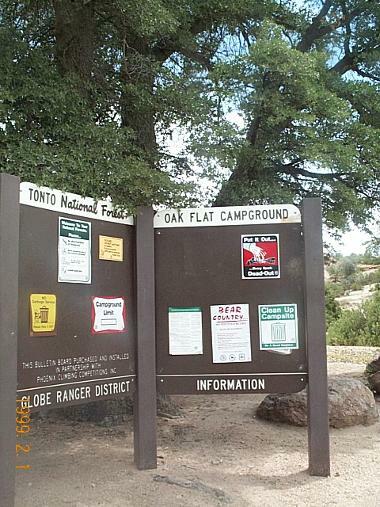 Bears will no longer have free reign to gather acorns with the San Carlos Apaches (whose territory this once was) from 150-year old oaks although Presidents Eisenhower and Nixon protected this area because of its uniqueness with Public Land Orders, which McCain, Kirkpatrick, Gosar and Obama ignored. 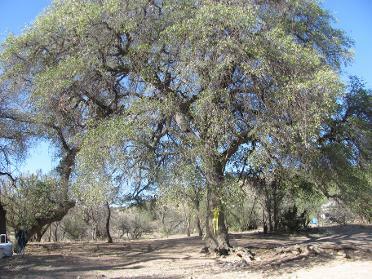 Emory Oak at Rosemont site that will be destroyed with another 33,000 similar oaks, and a total of 300,000 trees. I am a dedicated environmentalist who learned about “hardrock” copper mining the hard way. The local copper mine was polluting the public water supply. I gathered all the data from AZ Department of Environmental Quality and organized the figures and put them on a website [Original website]. Six years later the mining company had spent $15 million on remedying the problem and we had clean water in my homes. Of course, I then knew too much about mining, so I continued to help others with impending environmental problems due to hardrock mining. I had the wonderful opportunity to spend a year in the Sam Houston National Forest. I spent each day observing with surprise and delight the realities of a natural environment. Nature is such a miracle with its changing of costumes as the seasons cycle though the woods. Each season brings a new song and unique beauty to enjoy. My hope is that this book will inspire you to take time-out to enjoy and connect with the mystery of nature--and the mystery of You! 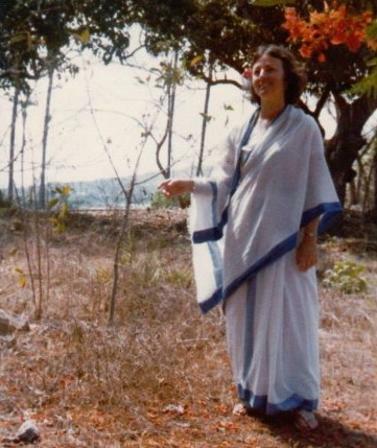 Nancy wearing a simple two-piece cotton sari under a blooming gulmuhar tree with bright orange flowers. 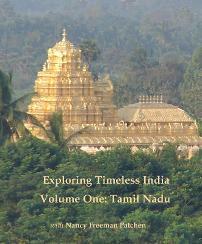 I was so enchanted with India that I went back for a three year stay as editor of a bi-monthly magazine. I was able to travel through the countryside, visiting the most beautiful natural lakes, beaches, mountains, even places no "European" had ever tread before. I was able to spend time with some wonderful wise men and women, school teachers, public officials, college students--all with their unique experiences and stories. I have compiled my adventures describing each state that I visited and have started publishing my journals and the first two are online! India has many realities--and the southern state of Tamil Nadu has the best of mountains, seashore, temples, wildlife sanc-tuaries. Due to its location, it was disturbed somewhat less by the marauding invaders from the Middle East and Europe. Traveling along with me, you will discover many wonderful people and places. 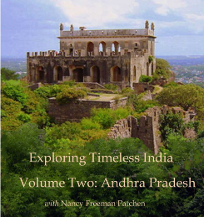 Andhra Pradesh was a territory was invaded more often and was ruled by various Muslim Shahs and Sultans since the 14th century. Its history is reflected with its many forts. However, the foreigners also brought much unique archi-tecture, art and gardens. AP is also a wonderland of bountiful nature. Nancy started her career at NASA in Clear Lake City, Texas. She worked in the Vibration and Acoustic lab as a liaison between technicians and reports. She was there at the time of the death by fire of the three Apollo 1 crew members and was involved in the data collection process. That incident made an indelible impression on her young mind. When her husband was transferred to California, she looked forward to the new state where she had spent the first year of her life. She took a position at the Stanford Research Institute in the Radio Physics Lab, again as a liaison between data collection and reports section. After a divorce, she had the funds to start exploring and investigating what life was all about. Her first stop was the University of Madrid, where she mastered a decent level of Spanish. She says, "I love the language and haven't forgotten it after 40 years!" On weekends and holidays, she explored that wonderful country and talked to many people, who she enjoyed and appreciated. That was 1976-77, the year of Spain's freedom from the clutches of the dictator Franco--and the whole country was celebrating. She regrets that she had not thought of being a writer at that time because it was a great year. She traveled through India for a couple of years and even spent 3 months in a small village in the Himalayas. I wrote about my adventures (and a few misadventures). One thing for sure, India and Indians are real.... just like me! I love it there and hope to retire there. At the present time, Nancy says, "I am looking for my next big adventure. There are still many places I want to visit and even more to which I want to return. The camera is charged up and my backpack is packed. "I've visited 49 of the 50 states and have taken in the beauty of this wonderful country.... It is so magnificent. God surely blessed America--but what are we doing to it?? "I have lived in Vermont, New York City, Washington, DC, San Francisco, Palo Alto, Houston, Sedona, Phoenix--and now sunny Green Valley, Arizona. In every place, there are wonderful places to enjoy nature. I was so fortunate, In New York City, I walked the entire length through Central Park going and coming from work (unless it rained). "My last wish is to visit Alaska and see the Aurora Borealis."